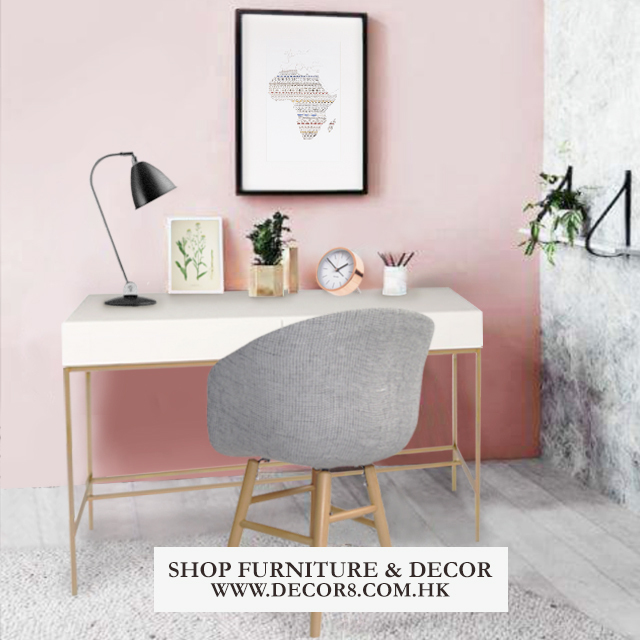 If you’re looking for a stylish study desk combination then you’ve stumbled on to the right page. Here we have a stunning Durand Desk with a shimmering brass finished frame. One of its greatest feature are the two large storage drawers that will make a great home for your loose writing utensils and important documents. We used the Whittier Chair with the natural oak finished legs to compliment a similar colour finish to the Durand Desk leg frame. Giving this soft comfortable shell a soft grey colour will make it stand out from the desk but not too much that it will overpower the style. Next we add the Best Style Table Lamp for directional lighting to keep the area well lit up whilst you work. Perfect solution for late night working whether you are writing an assignment or designing stuff on your computer. Working late into the night, you’ll want to be able to keep track of time so why not try the small but functional Karlsson Minimal White Alarm Clock. Make sure you set your alarm on and you’ll never have to worry about being late again. This entry was posted in Study and Work Desks, Table Lamps and tagged Chair, clock, decor8, desk, home furniture, office, office furniture, study desk, table lamp.